Discover the power of Pipedrive with a one month free trial access with all features. In this long-form review page you will find insights about the Pipedrive platform combined with my experiences. I wanted to give an in-depth review of this solution so you can compare my findings with other ‘deal management’ solutions you might consider. 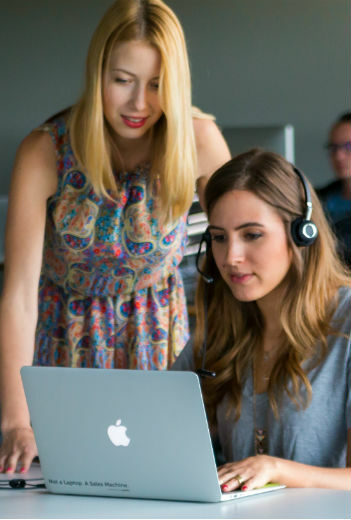 Look at this review as an informative piece of content helping you in your decision process for purchasing an activity based sales solution. In the tutorial video we will discover the ins-and-outs of Pipedrive, cover sales process overview and activity based scheduling. Special attention is given to views, filters and reporting. 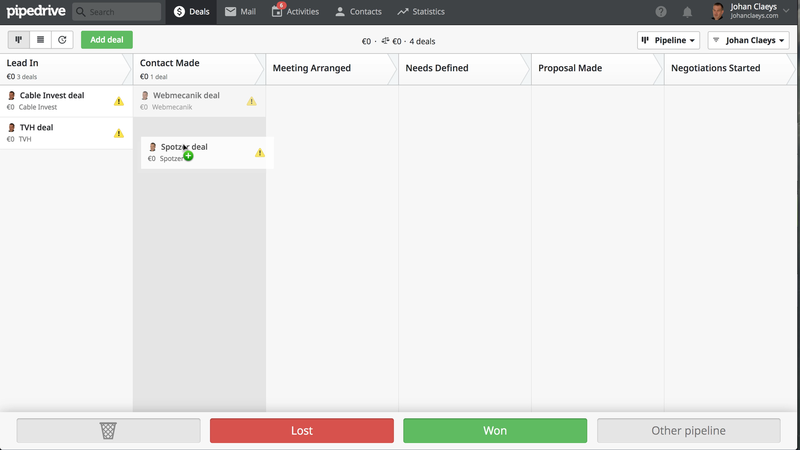 ​The Pipeline view gives you an overview of your sales process you're keeping track of. You assign and customise the stages that make up your sales. The sales process or pipeline is filled up with deals. A deal is any chance, any opportunity, any lead you have with a given person or an organisation you want to track. You can drag and drop deals to the right stage in the process, drag as lost or win. Pipelines are customisable and can cover different parts of your business. You can think of support pipelines, product pipelines,and many more. ​Activities such as Meetings, calls, lunches, emails …move your deals toward closing. In Pipedrive you have a preset list of activity types and as many activities you need to customize them to best fit your sales process. Your pipeline displays which deals have activities due, overdue or have not been assigned yet. Every deal has his unique smart email bcc address. With this, you can connect your emails automatically to contacts and deals, so you have a full overview of everything that's happening with a prospect in one place to consult. For full email sync you will need to connect your email provider with Pipedrive so you can send email right from within your Pipedrive. 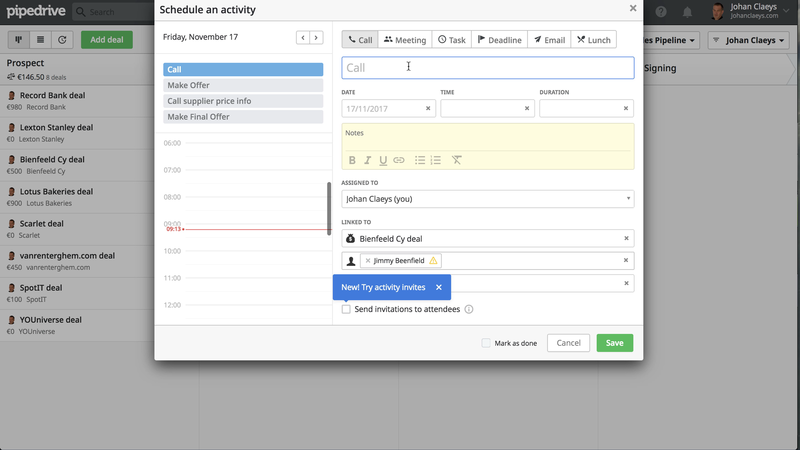 The activities view, gives you deeper insight, and allows you to filter your to-do list by deal or contact. This view can be altered into a calendar view and can be synced with your email calendar. Next to the pipeline view, you can have a revenue projection view with the revenue forecasts for upcoming weeks and months. Revenue projection requires that deal value and close date are added onto your deals. A listview displays your deals according their status. Customisable reports will help you understand pipeline metrics. How much money has been won how? How many deals? How many money has been lost. How many deals? What is the number of deals that have been converted? Visually see if you will hit year target and/or if measures are needed to stay on track. “Take actions that drive deals to close!" Pipedrive is ideal for small to mid sized businesses.and has a very short learning curve. If you are looking . for a simple, straightforward, activity based sales management tool that is customisable to suit your business with lots of features in a handy interface then at least trial this solution to help you at least better compare what is in the market. 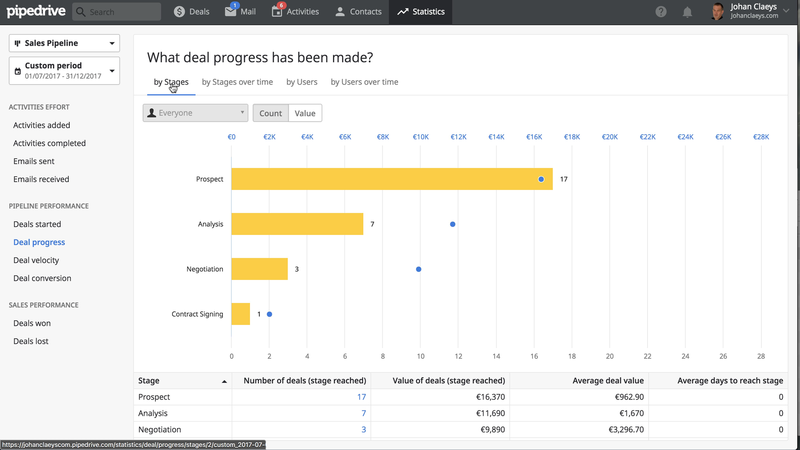 This tutorial review summary provides gives you at a glance the best way to manage your Visual Sales Pipeline For Managing Your Deals.